El BT-7 fue una modernización posterior de la serie BT, con 5.556 vehículos de diversas versiones producidos desde 1935 hasta 1940. The BT-7 is a direct upgrade of the BT-2, offering even more speed and acceleration, more HP, and much better turning properties. It is one of the fastest tanks in the game, in exchange for very poor armor and relatively weak armament. The BT-7 leads to the A-20. Low profile and good camouflage values. Paper-thin armor and below average HP. Disappointing damage and penetration on all weapons. The BT-7 is basically a slightly faster BT-2 with slightly more HP. It has an option of 2 top guns, however, the 45mm VT-42 is the superior choice for most, since the 37mm ZiS-19 has worse penetration, damage per shot, DPM, and aim time. The only advantage of the 37mm is a slightly higher rate of fire and marginally better dispersion. Compared with the BT-2, the BT-7 has better penetration, rate of fire, aim time, and accuracy, allowing it better performance at long ranges compared to the BT-2, and is no longer confined to close range knife fights. However, despite the upgrades, the BT-7 is still undergunned at tier 3, and similar to the BT2, the armor is still paper thin, and vulnerable to any incoming fire. The BT-7 excels as a raider/breakthrough exploitation tank, the role for which it was originally designed. Once it has broken through the enemy's front line, it can hunt down enemy snipers and, in skilled hands, cause a great amount of disruption. The BT-7 works particularly well in combination with other BT tanks. While adequate enough to allow the BT-7 to act as a battle tank in Tier 3 or 4 matches, all the weapons have insufficient penetration to deal with heavier tanks that the BT-7 faces in Tier 4. In such matches, the BT-7 is best used as a support sniper or flanker, not drawing any unnecessary attention to itself. While the BT-7 is quite capable of pulling off the circling technique against heavier tanks, this should only be used as a last resort. The BT-7's great speed and good camouflage also allows it to be used in the scouting role. Its superb speed will allow it to take up forward spotting positions quickly after the start of the game. However, the BT-7's view range is only ok, though this can be remedied to an extent with the use of Binoculars, Coated Optics. The BT-7 can also be used as a counter-scout, as it has the speed and sufficient agility and firepower to intercept most enemy light tanks without too much trouble. The first priority should be the 45mm VT-42 gun, since the 51mm AP pen on the stock gun is rather inadequate for tier III without excessive gold use. The BT-7 was the last of the BT tank series of Soviet cavalry tanks that were produced in large numbers between 1935 and 1940. They were lightly armored, but reasonably well-armed for their time, and had much better mobility than other contemporary tank designs. The BT tanks were known by the nickname Betka from the acronym, or its diminutive Betushka. BT (Russian: БТ) stands for fast tank (Быстроходный танк, Bystrokhodny tank). The successor of the BT-7 Tank would be the famous T-34 medium tank, introduced in 1940, which would replace all of the Soviet fast tanks, infantry tanks, and medium tanks then in service. 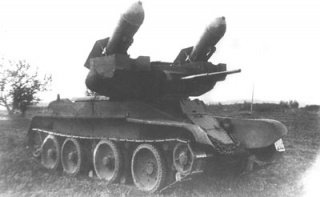 The first prototypes of the BT-7 had a distinctive canted-ellipse shaped turret mounting both the main gun and a coaxial machine-gun. The specification also called for the project to allow for installation without any significant change to the framework of new guns: the 76 mm CT or PS-3 main gun (a short-barreled howitzer) and the 45 mm 20K model 1932/38, a long-barreled, high-velocity gun useful against tanks, but less effective than the 76 mm gun against infantry. In the rear of the turret, there was housed a rotating drum-type magazine for 18 76 mm shells or a radio station. The prototype underwent an extensive testing program in the summer and autumn of 1934. As a result of this testing, it was felt that a machine-gun was unnecessary on a tank with a 3-man crew, especially as it made the assembly of the turret more complicated. Therefore, in early 1935, the tank went into production with a simpler design, incorporating the turret from the BT-5. (However, the idea of wheeled/tracked vehicle with a 76 mm cannon was not abandoned and the plant was commissioned to develop a new BT-7 turret from the turret of the T-26-4). In the production model, a cylindrical turret housed a 45 mm 20K gun with a DT-model machine-gun. On some of the tanks, a model 71-TC radio with frame antenna was installed. The crew consisted of three men: the commander (who also served as the gunner), the loader, and the driver. In 1937, the company launched production of the BT-7 with a conical turret. Main armament remained the same, but the ammunition was increased to 44 rounds. li�Userving tanks now installed the DT machine gun in the rear niche. For the firing of the gun and coaxial machine gun at night, the tank was equipped with two special projector-type headlamps, and a mask placed on the gun. Subsequently, these Lights were retrofitted to earlier models of the tank. Improvements were also made to the drive wheels, caterpillar tracks, and gearbox by 1938. In parallel with the main modification, 154 BT-7A artillery tanks were produced between 1936 and 1938, fitted with a larger turret and a 76 mm CT-type gun, with 50 rounds of ammunition (40 in a tank with a portable radio). In 1938, four experimental BT-8 tanks mounted with V-2 diesel engines were produced. 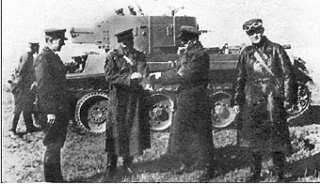 After comparative tests of the BT-7 and BT-8, the diesel tanks were put into production in 1940 (under the designation BT-7M) with the powerplants being produced in a separate plant of the Voroshilovets factory to ensure supply. From December 1939, the BT-7A went into production with some minor modifications; additional bracing for rigidity, a manhole underneath, and a smaller air filter. The diesel-powered tanks showed much-reduced fuel costs, and the petrol tanks were soon placed into reserve. Several experimental tanks were conceived based on the BT series, for example: the wheeled BT-IC, designed by NF Tsyganova, a platoon commander in the 4th Armoured Regiment of the Ukraine Military District and self-taught designer. The type successfully passed field tests, but was not ordered in bulk. Another Tsyganova design was the S-2 "Turtle", with a new design of hull and turret. 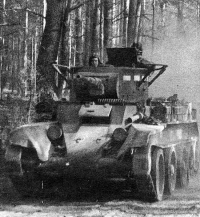 There was also the command tank CBT-7 with a fixed turret, the OT-7 mounting aflamethrower, the HBT-7 designed to protect from toxic contamination and lay smokescreens, the PBT bridgelayer, and the TTBT-7 and Thubten-7 radio-controlled tanks (known at the time as Teletanki). Shortly before Operation Barbarossa, the BT-7 underwent an up-armor program. In 1940, Mariupol Ilyich Iron and Steel Works produced 50 sets of hinged homogeneous armor for the BT-7M, which increased the weight of the test tank to 18 tons. On the installation of these kits to military units, unfortunately, nothing is known. BT-7 and T-26 with_additional armor are moving to the frontline. 5th Tank Brigade Western Front, Nov.1941. 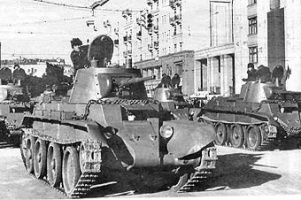 Between 1935 and 1940, between 2700 to 5328 BT-7 tanks of all modifications (except BT-7A) were built. 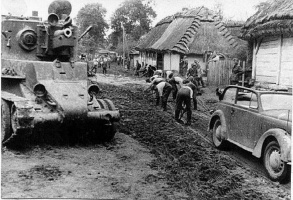 They were operated by the armored and mechanized forces of the Red Army for almost the entire war. Over 2000 BT-7 series tanks were lost in the first 12 months on the Eastern Front. Hundreds had been immobilized even before the invasion by poor maintenance, and had to be abandoned as all Soviet forces withdrew eastward. The survivors fought against the Wehrmacht in numbers gradually reduced by attrition, until superseded by more modern types in 1944. The BT-7 series continued in use elsewhere, including being used against Japanese forces (Battle of Khalkhyn Gol and Manchurian Strategic Offensive Operation) in Manchuria in 1945. 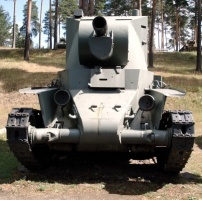 BT-7A Artillery support tank was a self-propelled gun variant, armed with a 76.2 mm howitzer. BT-7 Light Tank Photos & history. BT-7 Light Tank at battlefield.ru.